SIGN UP HERE! DO IT! Spring Ongoing Show Voting has Begun! The time to vote for our spring 2013 ongoing shows is upon us. Those of you that are paid members should have receieved an email from the President with the password to access the ballet. Just pick your top 3 shows you would like to watch this semester, fill out the form with your name and Truman email( if you do not have one, just use another one, we use this as identification purposes). Voting ends 12:00 PM Friday, February the 8th. 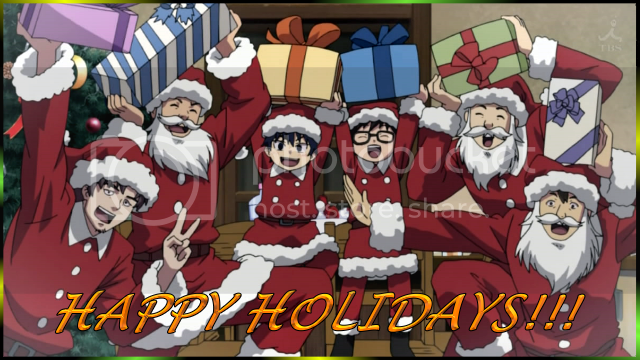 Happy Holidays from the officers of the Anime Club! Here's hoping your bellies are full and your cups empty, and your stockings full of random assortments of goodies! Go ahead and toss in the comments what everybody gets (or have already got). Also, for all of you traveling in the next few days, be it out of town or coming back home, travel safe. Greetings, all! It's time for the annual Holiday party 2012! Or Christmas Party, if you will. It shall be this Saturday, December 8th, in the 1200 wing of Violet, as per normal partying standards. Also per partying standards, it shall run from 6 to midnight. Come one, come all, bring some snackage to share with friends. Should be between $15 and $25 in value. You are allowed to bring something of greater value than $25, just know you will probably get something of less value in return. No food items. Long ago, somebody brought a large box of goldfish crackers as their gift. Needless to say, the person who got it was none too pleased. Small snack items can be used along with another item, so long as the item makes up a majority of the value. The gift exchange will be some time between 9 and 10 most likely. Must be present for presents to be presented to you. If people ask to start before 9, I will likely take off my shoe and hit you with it, unless I am given a good reason why we should start prior to 9. So, yeah. Hope to see everybody there. Here's to good vibes, good gifts, and a good end to a semester. Greetings, everyone! The webmaster has gotten the president to stop being a bum and post stuff! This Friday, October 12th, will not be an official meeting for Anime Club. For those of you that will be here, the room is still reserved in our name, at the same time. I just checked my email to make sure. What does unofficial mean? It means that whoever shows up gets to watch whatever they want. It will not count towards the continuation of the ongoing shows, and the grab bags that were voted on this past Friday will have to wait a week. For those of you that are going home this weekend, drive safe. For those of you that are staying in town, party hardy, and don't wreck MG 1000. Officer Voting has officially started! Check your email for a newsletter from the President that contains the password to the officer voting page. Voting ends Thursday April 12th at 11:59pm.